In 2015, I plan to be powerful in managing my finances. It’s time to retire the wishy-washy worried woman act. Let’s go into the new year with confidence! I’m feeling inspired because I just read Suze Orman’s Women & Money: Owning the Power to Control Your Destiny. She said she finds that way too many women feel insecure about their finances and are committing financial suicide. In this nifty, little $9.99 paperback, Suze features examples of nurturing, competent women who take splendid care of others. But they feel guilty about spending on themselves and investing in their own future. And when these women are relationships, they typically can’t wait to turn money matters over to their partners, especially if that partner is a man. This is true of even highly-educated professional women. Ouch, ouch and ouch. Was Suze spying on my marriage? Sounds like she also knows too much about my post-divorce romantic disasters. Why was I always looking for a guy to take care of me financially? After a decade as a single mom, I’m finally finding my own confidence. But in reading Suze’s book, I can see that remnants of the old me linger on. The situation calls for some fine-tuning. To put the issue in Suze speak, I need to make myself a truly wealthy, powerful woman. While the book is written for women, I think it would be just as interesting for any man who has money anxiety. There’s plenty of useful info here, all of it presented in plain, simple English. I really like Suze’s detailed, lengthy explanation of why it’s not enough to have a will when I die. She also offers practical advice on how unmarried couples can divide household expenses equitably. Plus, I am now sold on the importance of opening a savings account, even though my bank pays a pathetic interest rate of less than 1%. What counts is the practice of saving. The pages also explain basics. Do you need to know how mutual funds and various interests work? Are you clear on the difference between good and bad debt? Maybe you need step-by-step advice on how to strategically pay down credit card bills, manage college tuition expenses and choose life and home insurance. Suze says that in an economy where layoffs are rampant, every person needs to build up a savings account that can cover up to eight months of living expenses. The law requires the three credit bureaus to give us each a free credit report once a year. Sometimes there are errors we will want to fix, or problems to address. To get the report, go to annualcreditreport.com. If you want to shop around for a no-fee bank checking account, bankrate.com is a good place to compare rates. Be prepared to feel sad, though. Rates are woefully low. There’s a category of worker that we haven’t yet included in this discussion: artists, writers, teachers, activists, and others who have chosen their professions not for the pay but for the satisfactions and nourishment their work brings to their souls. I hope those of you engaged in this type of work realize every day that you are not on sale, that you are doing what you love, and how grateul the rest of us are for what you do. And if you’re feeling nosy, check out Suze’s Dec. 11, 2014 interview with the Wall Street Journal. It’s about her real estate holdings and has a little about her personal life. How about you and your finances? Any thoughts on where things will go in 2015? It’s funny that you made this post on your blog Betty, on Saturday night I saw, Suze Orman’s TV show on CNBC money. I thought to myself, this woman has such a straight forward direct approach and positive attitude about money management, savings and the ever present bankruptcy and student loan issues. I like the call in part of her show where callers as for advice and help in money management, 401k’s, Roth IRA rollovers, retirement and if with their current cash flow \would they have enough money to take a vacation or buy a car or new home. I suggest if you are female or male (as there were male callers into her show too) that you take advice and the time to watch her show. It’s called “The Suze Orman Show” aired on CNBC. Thank you for making this post very informative and helpful I will definitely pass it on, good day! Thanks for the reminder, Walter! I still haven’t watched her show. Been too busy reading her books. But you’re right. I should see what she’s like on air. What I like best is her ability to deal with our emotional issues behind money. How we feel about $ impacts how we manage $. Also wanted to mention…For the past year, I’ve been using an app on my phone to track my spending habits. It’s been very useful. I highly recommend the Pocket Expense app. You can’t get it on your computer but the app allows you to generate customized pdf’s of your expenses. So you can get the numbers off your phone that way. Thanks for the app I just installed it very helpful, I will tell my wife about it too. It’s a good way to start off the new year.. Happy New Year..! Great, Walter! I learned about the app from one of my smart college students. Hope you’ll enjoy it. I know it saved me from a lot of craziness in 2014. Happy New Year to you too! Exactly, she gets to the real cause of people’s money management issues, she’s straight with the callers and gives good advice too. Very positive as well. I watch so little TV but Walter, I will make time for Suze. Thanks again! always love reading your blog! here’s a fun money-saving trick that appeared on fb (from obvious magazine), but i found this graphic much more appealing. 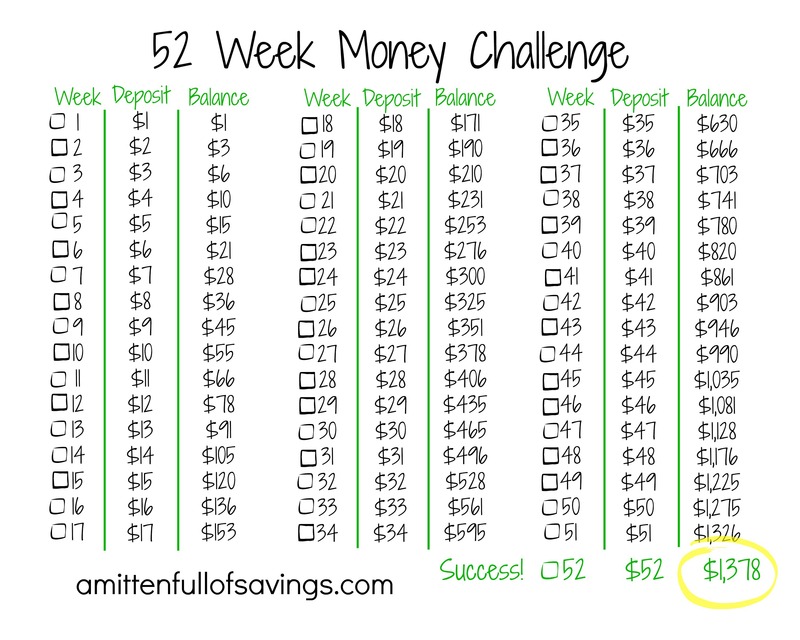 basically you start the year by saving $1, then each week you had another dollar to that pot: i.e., $2 the second week, $3 the third week, etc. not necessarily in a bank (but you could totally do that & grab that piddly interest) — i’m using an envelope; one woman said she makes 52 envelopes for the year, but that seems like a lot of wasted paper, unless you reuse them each year. anyhoo, here’s the graphic — happy saving & here’s wishing you a most abundant new year! It works! The end-of-the-year payments are more demanding. By November, we’re talkin’ about much more than a dollar or two like what we’re doing in January. That taught me to keep up with the weekly payments. If I let them slide, then I was suddenly scrounging up $126 for three weeks instead of $40-something per week. Do you like the envelope? I also found that I enjoyed ritualizing my weekly savings. I’d mark it off on a little calendar and then, put the cash into a cute little candy tin that I found at a tag sale. I looked forward to taking the loose bills and subbing them out with a crisp Benjamins. Etc., etc. I’m doing it again this year. Yay, we’re doing something together! The funny thing is, now that I have the savings from last year, I don’t want to spend it! At least, not all at once. It’s nice to have the cash on hand: $1,500 in crisp, $100 bills. In fact, I’m thinking of opening a savings account. Big love and blessings to you too. Someday, I’ve gotta get to your neck of the woods and take a yoga class.